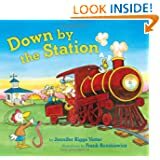 Today we read, "Down by the Station" by Jennifer Riggs Vetter. We made a kitchen chair train after we read the book. This is one of my go to activities with my kids when I need to get things done and I want to keep them busy. They set up their animals and take turns being the conductor. Aubrey even put a coat on her stuffed dog so he wouldn't be cold! This idea is easy and perfect for a Friday afternoon. I know I really enjoyed the quiet while my girls played nicely!